What's In A Share Basket? How Does City Fresh Work? As a shareholder, you will select a pickup location at one of our neighborhood Fresh Stops and decide on the quantity of produce (Single or Family sized) you would like. You can order as many weeks at a time as you wish. It is, of course, a big help to us and our planning if you order multiple weeks up front, but a unique feature of City Fresh is our flexibility. When you arrive for your first week’s pickup, you’ll be greeted by our team of Fresh Stop Managers and Food Justice Warriors. 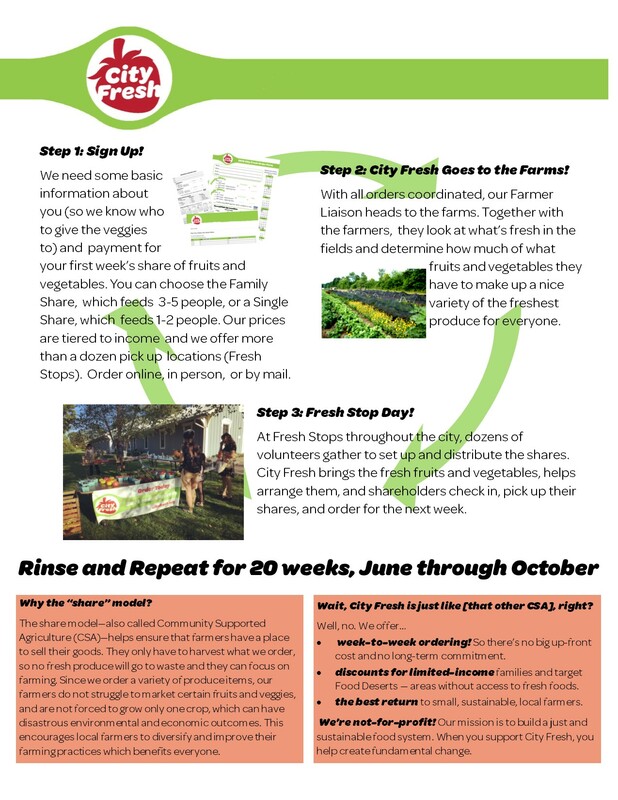 Our Fresh Stops are managed by members of your community who dedicate 20 weeks of their summer each year to ensuring their families and their neighbors have access to the freshest produce possible. Their volunteer efforts ensure that everyone has equal access to the healthiest and most affordable food in the region. These fine folks will sign you in, take payment for future weeks if you haven’t already paid, and help you through the line, answering questions and happily swapping recipes as they can. Once we have all of our orders in for the week, we source the produce from a network of more than 20 small farmers within 70 miles to build the most varied possible “share” of in-season fruits, grains, vegetables and some value-added products. Our core network of farmers are Amish and they have been with us for eleven years. We’ve been together through marriages, births, barn-raisings, and even family tragedies. Their anonymity is part of their religious heritage and you will never see an image of them or their land in any of our marketing materials. Each morning during the week, we arrive for the harvest and loading of the truck, aggregate and sort everything at our cooler located at the George Jones Farm in Oberlin, and then we venture on to the city with your shares in hand by mid afternoon. The shares are unloaded and counted by our staff and volunteer teams at each Fresh Stop just in time for your arrival. Those new to the program should be aware that the first two to three weeks of shares each season are merely a taste of what is to come by mid July. We can only harvest what is in season and ready for picking. You wont find watermelons or sweet corn in June nor strawberries and peaches in October. This seeming lack of choice can be a shock at first, but eating a varied diet in season is incredibly rewarding. I have always thought that with CSA’s, we get to make one very important choice, and get to forego all the multitudes of choices at the grocer. And with the majority of grocers stocking only two or three varieties of tomatoes across the country, perhaps two or three varieties of bell peppers, and so on – perhaps what we are foregoing is the illusion of choice. We strive to include many common vegetables you’ll be familiar with in the kitchen, selecting unique regional varieties and heirlooms that perform well and encouraging our farmers to save seed when appropriate. We also pride ourselves on introducing you to lesser-known items such as romanesco broccoli, kohlrabi, and garlic scapes. Our pledge to you is that we will never overload you with any one item (you’ll never get more than a 1 lb bunch of kale for instance) and we won’t bombard you with unfamiliar items. If you are struggling to identify an item or make sense of how to use it, our volunteers can be exceptionally helpful, our weekly newsletter will highlight some good options for the rare items, and of course an internet search is just a few clicks away for most. We are consistently 20-40% cheaper than the grocery store, and unlike the typical grocery store, where only 5 to 15 cents of your dollar goes to the farmer who grew your produce, 81 cents of your City Fresh dollar goes directly to our farmers. In 2015, more than $130,000 of produce was purchased by our shareholders, 102 volunteers made the Fresh Stops possible, and just two full time and three part-time staff worked behind the scenes to bring City Fresh to life. The 2018 City Fresh season begins the week of June 11th and runs 20 weeks into October. Orders can be placed online by credit or debit card, or by mailing a copy of the order form and a check or money order to our PO Box (c/o City Fresh, PO Box 357 Oberlin, OH 44074). Those with the Ohio Direction/SNAP/EBT card can place your order by phone (440-707-6606) or by mail using the order form. If for any reason you will not be able to pick up your share for the given date and you can tell us by the Friday before your pickup date, we can forward your payment to a future week. If you forget to pick up your food, or cannot let us know of your conflict before the prior Friday at 5:00 pm, we will donate your share to a family in need. Thank you so much. We look forward to seeing all of you this coming summer! © 2019 New Agrarian Center. All Rights Reserved.